Slip, pbk, 6.75 x 9 in. / 264 pgs / 200 color. 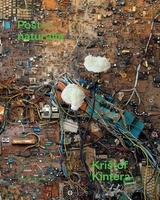 This book documents a new sculptural installation by Krištof Kintera (born 1973) at the Collezione Maramotti, a work that examines a profound change in our reality—that our daily experience no longer belongs solely to the natural world. FORMAT: Slip, pbk, 6.75 x 9 in. / 264 pgs / 200 color.